I was shocked when I heard about the death of my friend Carlos Fonseca two weeks ago. He was in Ginnie Springs, Florida about to start exploring a cave system called The Devil's Spring. The following day rumours started to circulate on a couple of diving forums that Carlos had died while inside the system. How he died is not really known. When most people think about Florida, they probably think about beaches, theme parks and outlet shopping. When I think about Florida, I think about underwater caves. The sunshine state sits on a bed of limestone that percolates with fresh water. The result: dozens of springs that form a latticework of tunnels running for dozens of kilometres underground. Scuba divers have been exploring these caves for decades and they've pushed the boundaries back for thousands of meters and discovered some truly amazing wonders -- like a scene from a science fiction movie these dark chambers when illuminated reveal some truly jaw dropping wonders. I've swum through tunnels no bigger than the hallway in my house only to suddenly find myself floating in a chamber that could comfortably fit a small cathedral. The water in these tunnels and caves is usually crystal clear and there's an almost preternatural feeling to floating in them. And when you douse your light, the kind of darkness that exists almost can't be described: not being able to see your hand right in front of your face is a start; an absolute darkness in which not a single vestige of light survives gives you a little more of an idea. The eyes strain to find something to see and fail utterly. 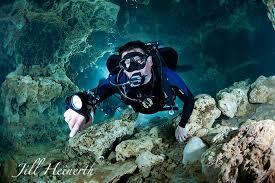 Cave diving is probably the closest I'll ever come to the experience of being in outer space. Now, make no mistake, this kind of scuba diving is dangerous. In fact it's the most dangerous form of the sport on the planet. There is very little margin of error when you are half a kilometre inside the earth and possibly more than 50 metres deep. Intense training is required before you can even poke your nose inside one of these caves. Strict adherence to safety protocols is a must. Your gear has to be the best and your partners equal if not better than you in experience. Teamwork is not just a suggestion; it's an unwavering protocol. Yet even under those conditions people die frequently. A report in the International Journal of Aquatic Research and Education stated that about 10 cave divers a year die on average. That may not seem like a high fatality rate, but there are there are only a few thousand cave divers in the world. Compare that to the statistics on recreational diving where fatalities run at about one diver in 15,000 every year. Nonetheless I was shocked when I heard about the death of my friend Carlos Fonseca two weeks ago. He'd posted on Facebook that he was in Ginnie Springs, Florida about to start exploring a cave system called The Devil's Spring. The following day rumours started to circulate on a couple of diving forums that Carlos had died while inside the system. How he died is not really known. The Gilcrest Country Medical Examiner still hasn't released its report and the Sheriff's office isn't saying much. A couple of eyewitnesses and his diving buddies suggested that Carlos might have breathed the wrong gas mixture. You see pure oxygen is poisonous below six meters. Divers carry it to shorten decompression times but only breath it when they're just below the surface. Some suggest Carlos may have selected the wrong tank accidentally and breathed pure oxygen at depths that exceeded 20 metres. That brought on a seizure that ultimately killed him. But all that's speculation at this point. Eventually we'll find out what really happened but in the meantime I mourn for my friend Carlos. He was a big bear of a man with a great sense of humour and a desire to help others. He had an infectious sense of adventure and he will be missed by family and friends. So you can imagine my surprise when the same online forums that had prematurely announced the cause of his death began to systematically tear into Carlos with a vehemence that was astonishing. His alleged mistake was uncharitably described by one person as a "diving 101" error. Others piled on and began attacking his personality stating Carlos "was more concerned about his image as a diver" than safety and suggesting he was always "needing to boost his accomplishments." One particularly malicious individual described the ordeal of trying to save Carlos as pushing a "240 pound pork chop" through a tunnel. I spent a lot of time on those forums suggesting that people wait until the medical examiner's report was complete and refrain from character assassination while Carlo's family was still grieving. But I also spent a lot of time thinking about why people would do this. After all if we find out that a friend or colleague has tragically died in a car accident most people don't start insulting the victim's driving skills; they understand that mistakes are a part of life and grieve for the loss. Yet this isn't the first time I've seen this kind of feeding frenzy related to extreme diving. So what motivates this behaviour? My first thought is that maybe this behaviour is caused by fear. 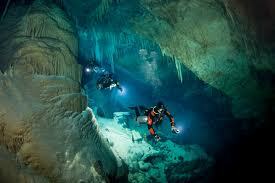 There is no question that cave diving is a very dangerous activity. But if you can attribute an accident to someone's stupidity or sloppiness, perhaps you can convince yourself that you would never make that same mistake. It's a form of finding immunity because of other people's supposed stupidity. Find a flaw in someone who's just died in an accident and you can tell yourself that you don't have that flaw so your chances at dying are substantially reduced. My second thought is people might behave this way because it's human nature. We all live with a bit of an immortality myth, particularly when we're very young. If we stop and think about it, we understand that death is inevitable. Yet most of us have some notion that though it applies to us, it's nothing that we're going to have to deal with until some vague time in the future. Perhaps being reminded that death is ever present evokes a hostile reaction. My final thought is that in some odd way, perhaps this online reaction to Carlo's death is yet another variation of an old Zen story. A master sits with his student and draws two lines in the sand. He asks the student how he would make the line of the left bigger. The student promptly cuts the line on the right in half. The master shakes his head and instead makes the line on the left longer. The lesson: always strive to make your own line longer not the other person's shorter. Are some people trying to make themselves seem better by tearing down Carlos? Now be clear. I'm not suggesting I've never jumped to a conclusion or passed judgment on someone. Quite the contrary, I've often been far too hasty in making assumptions about events that I don't have all the facts on. And I'm not trying to suggest that cave diving doesn't scare me. I'll admit that I'm a little afraid every time I go in a cave. That might be a good thing. That little edge of fear probably keeps me obsessively checking on my equipment, my diving partners, my gas supply and the location of my line out. I'm also not oblivious to the fact that nobody is perfect. Carlos lived his life in an intense way and anyone who wrings every drop out of life will usually run afoul of someone. But at this particular time, I'm choosing to remember Carlos with affection, not to criticize his final actions. Carlos death will not stop me from going back to explore the cave systems in Florida. But I will think about him every time I head underground.